New Year's Eve is just around the corner and, if you're wondering which bubbly to pop for the big night -- or anytime -- look no further. Renowned wine educator and expert Kevin Zraly shared his selections of the best in bubbly, on "The Early Show" Monday. Zraly is the former wine director of Windows on the World restaurant (which was in the World trade Center) and is the author of the 25th anniversary edition of the "Windows on the World Complete Wine Course Book." Not only did he name names of the Champagnes and sparking wines he recommends, he demonstrated the proper way to ice and open bottles of bubbly! Keep your bottle in a Mylar bag before putting it on ice, so you're able to keep the moisture off the bottles. That way, the bottle won't slip out of your hands when you open it. You also don't want the bottle dripping on people or tablecloths! To open the bottle properly, follow these simple steps: Make sure your bottle of bubbly is well chilled before opening; cut the foil around the top of the bottle; place your hand on top of the cork, never removing your hand until the cork is pulled out completely (that may seem a bit awkward, but it is very important); undo the wire, either leaving it on the cork or removing it carefully; carefully put a cloth napkin over the top of the cork; if the cork pops, it will go safely into the napkin; remove the cork gently, slowly turning the bottle in one direction while turning the cork in the other. The point is to ease the cork out gently rather than cracking the bottle open with a large pop and letting it foam. That may be fun, but it does nothing for the Champagne because, when you pop off the cork, you enable the carbon dioxide to escape, and that carbon dioxide is what gives Champagne its sparkle. 1. Serve it very cold. 2. Ninety-nine percent of all Champagnes do not need any aging. 3. There are three different levels of Champagne (NV, Vintage, and Luxury). 4. All Champagne are sparkling wines but not all Sparkling wines are Champagne. 5. Served in the tulip-shaped glasses. Both Pommery and Veuve Clicquot are two of the top Champagne producers available in the U.S.. and both are of high quality AND reasonably priced, which is always what the consumer wants to know. Good Champagnes can vary in price. Although French Champagne remains one of the great value wines in the world, a non-vintage bottle will still cost anywhere from $35 - $50. The $64.95 price tag for the Veuve Clicquot is justified by the incredible history of winemaking behind this brand and by the quality. It is a big, full, rich-style Champagne which is aged and a great example of the wine maker's art. It is a splurge for many, but a wonderful way to begin a fresh New Year on the right note! Prosecco is an all-purpose wine that will go with almost anything, including fruit, which adds a refreshing extra zing of acidity. Zraly had the Zardetto variety on the set. Because Prosecco is such a perfect match with fruits, it's the wine Italians use to make the classic Bellini and Mimosa drinks. The Prosecco Zraly had on the show is from the Veneto region of Italy. It's one of the best values in sparkling wines. The delicate flavors of Prosecco will get lost when paired with steaks or hearty stews, so it goes best with fruit. Bottles sell for $12.95. Cava, the sparkling wine of Spain. On the show, Zraly had Segura Viudas Brut Reserva, nicely priced at $9.95.This goes well with olives, prosciutto, and manchego cheese. Zrano says, "Whenever I have any wine, I think of where it comes from and the kind of food that is consumed in the region. When I think of anything Spanish -- including Cava -- I think of a tapas bar filled with olives, meat and local cheese, and these always pair well with the wines of the region. Cava is a blend of many indigenous grape varieties. It is made in the Champagne process by Freixenet which is one of the largest producers of sparkling wine in the world." Roederer Estate, a sparking wine from California. Sells for $18.95. Roederer, Zraly explains, "is a French family that came to California. It's the same family that makes the famous and expensive Roederer Cristal Champagne. This is made in the Champagne process with Chardonnay and Pinot Noir. The sparkling wines of California have gotten so much better over the last 20 years. The Roederer is a very food-friendly wine and pairs well with appetizers, like quiche and our shrimp here, because it is a very balanced wine (meaning that acidity, touch of oak and fruit flavors are all balanced). It can be paired with appetizers or hors d'oeuvres such as oysters, clams, shrimp, sushi, fried calamari, caviar (saltiness balances out the acidity), quiche, nuts (almonds). We have appetizers here but for a main course pairing, it goes well with lobster, scallops, chicken in a white cream sauce, shiitake mushrooms, risotto, light fish in a cream sauce (halibut, sole)." Pommery, which retails for $42. According to Zraly, Pommery "is a very good non-vintage Champagne. Now, while it retails for $42, you can find it for $32 and up in most places. Salted nuts and parmesan reggiano cheese work well with the Pommery Brut Royal NV, because the Brut Royal is also a very balanced, elegant wine with a lot finesse, and the balanced acidity and fruit plays well on the palate against the saltiness of these two foods." This is, says Zraly, "the No. 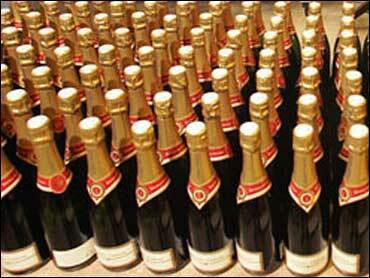 1 Champagne sold in tablecloth restaurants in the United States. It is more exclusive than a non-vintage. With an older Champagne, you would serve different foods than with the non-vintage. Lightly smoked foods such as salmon, smoked Gouda and also caviar work well with a vintage Champagne like the 2002 Veuve Clicquot, because most dry sparkling wines, such as brut Champagne and Spanish cava, actually have a faint touch of sweetness. That makes them extra-refreshing when served with salty or smoky foods.